TALLAHASSEE, Fla. — LSU senior catcher Sahvanna Jaquish drove in four runs and Carley Hoover entered in relief to hold off No. 4-seed Florida State, as the LSU Softball team advanced to the Women’s College World Series for the third-straight season, 6-4, on Sunday afternoon. The Tigers booked their tickets to Oklahoma City for the sixth time in school history and the fourth under head coach Beth Torina. With the victory, LSU extended its streak to 10-straight wins in elimination games during the NCAA Regional and Super Regional. It was the 15th win facing elimination over the past three seasons. No other team has more than eight. LSU fought off dropping the opening game of the Super Regional to advance to the Women’s College World Series for a second-straight year. The Tigers became the eighth team to do it on the road and the first to do more than once. LSU (47-20) will face UCLA in the opening game of the WCWS on Thursday. Game time and television coverage will be announced soon. Seniors Bailey Landry and Jaquish led the way at the plate. Jaquish was 2-for-3 with four RBI on the day. Jaquish moved into sole possession of 10th place in the NCAA career-RBI list with 267. Landry was 2-for-4 on the day and with an RBI triple in the top of the sixth, the Louisiana native set the career record for hits with 291. Carley Hoover (15-7) earned the win in relief as the junior went 3.1 innings. Hoover allowed just three hits and one run to keep the Tigers in contention. Florida State (55-8-1) hadn’t lost a home game in 2017 until being upended by LSU on consecutive days. FSU’s Jessica Burroughs (27-5) suffered the loss. Burroughs gave up four runs on six hits in 3.2 innings Sunday afternoon. The four runs were tied for the most allowed by Burroughs all season. 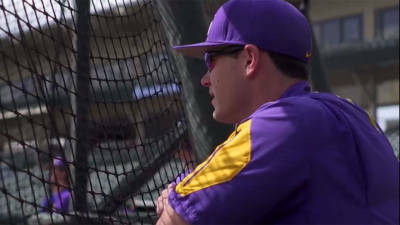 LSU got to Burroughs early as the squad put up two runs in the third. With runners on first and second, Jaquish laced a two-out double down the left-field line to give the Tigers a 2-0 lead. FSU brought the game within one off of LSU starter Allie Walljasper. In the bottom half of the third, third baseman Jessie Warren led off with a single. A double to left field by designated hitter Alex Powers on a 3-2 count plated the Seminoles first run. The Tigers did more damage in the top of the fourth inning with two outs to take a 5-1 lead. With runners on second and third, center fielder Emily Griggs hit a sharp single to third base to score a run. Jaquish followed with two more RBI on a single to center field. The Seminoles made it interesting in the bottom of the sixth inning. Hoover allowed a double and back-to-back walks to load the bases with no outs. Hoover and the Tigers’ defense buckled down with a fielder’s choice and a sac fly to limit the damage and make it a 5-4 game. Landry delivered one of the most important hits of her career in the top of the seventh inning to give LSU a 6-4 lead. After Jaquish reached on a one-out walk, Landry tripled to left-center field to set the career hits record and score pinch runner Nicky Dawson from first. Florida State once again threatened in the bottom of the seventh inning after a leadoff single and wild pitch. With one out, first baseman Carsyn Gordon singled to center field. Looking to move to second on the throw, Carsyn was thrown out by first baseman Amanda Doyle to end the threat.